Real Madrid extended their games streak without winning to three, after losing 2-1 against Getafe, at the Coliseum Alfonso Pérez. The Merengues scored the opener still during the course of the first half, but were once again victims of their own mistakes and a couple of bad decisions from the referees. Getafe turned things around after the break, as Real Madrid confirmed to still be far from their best form, at this very early stage of the season. 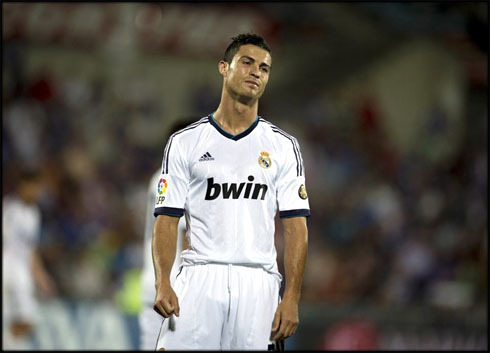 Getafe hosted and defeated Real Madrid this Sunday night, in a 2-1 victory achieved at the second-half of the game. Despite Gonzalo Higuaín's opener before the first half an hour of the game, the Merengues never found a way to impose their best rhythm and dominate Getafe as they would have wanted. A big defensive mistake in a Getafe free-kick, allowed Valera to equalize the game shortly after the second-half had started and to make things worse, Barrada applied the final blow to an unrecognizable Madrid side with still 15 minutes left on the clock, in a play preceded by an handball from Colunga that allowed him to easily get past Raúl Albiol. Real Madrid has now fallen 5 points behind Barcelona, with only 2 games played in the current La Liga season. Real Madrid couldn't have wished for a worse start than this, as they once again slipped in La Liga, dropping another 3 points that can turn out to be crucial later in the season. With Pepe still sidelined, José Mourinho picked Raul Albiol to go along with Sergio Ramos on the center of the defense, but the Merengues never appeared to be as solid and secure as they used to be last season, with the Pepe and Sergio Ramos partnership. Without playing at their best, Real Madrid got very close to the first goal near the 15th minute of the game, in a great combination between Cristiano Ronaldo and Mesut Ozil. The two players exchanged a few passes as they were entering Getafe's area, until Ozil found himself with an empty goal opportunity, just 3 or 4 meters away from the goal line. Unfortunately for the German midfielder and for the Merengues, Ozil failed to burry this chance and the result would keep goalless for at least a few more minutes. Before the first half of an hour ran out, Real Madrid managed to get the ambitioned lead from a good finish by Gonzalo Higuaín. The Argentinian forward was assisted by his fellow countryman, Angel Di María, escaped the marking from Alexis, rounded Getafe's goalkeeper and striked to an empty net with his left foot. Even though the Merengues weren't impressing that much so far, the one goal lead appeared naturally as neither Getafe was also creating much danger upfront. The match would drag until half-time without any other major incident and José Mourinho was certainly aware of the importance of holding this advantage, in order to avoid Barcelona increasing the gap between the two teams in the Spanish League standings. Surprisingly, or maybe not, Real Madrid commited a serie of major mistakes after the break, starting with a set-piece defense near the 52th minute of the game. Getafe earned a side free-kick at the right attacking side and as everyone expected, Barrada made a long cross towards Real Madrid's area. What happened then was that several Merengues players held their position in hope of leaving Getafe players in offside, while others followed the ball trajectory, putting everyone onside. The result was a free header to Valera and a helpless Casillas who could only attempt to reach the ball without many chances to stop it. May it have been a matter of discoordination between the players or a huge lack of concentration, Mourinho surely has some homework to do with his side, as they will prepare to host Barcelona for the Spanish Supercup 2nd leg at the Santiago Bernabéu, right this Wednesday night. After the goal, the Portuguese coach tried to shaken things at the field, bringing in Benzema for Diarra at the 58th minute and Morata for Di María later on, with still 20 minutes left on the clock. However, Real Madrid wasted a few good chances to regain the lead and it was Getafe who ended up coming on top. Close to the 72th minute, Colunga received a long pass on the left attacking side, still near the midfield line. Raul Albiol, who was marking his opponent closely, immediatly felt behind him, as Colunga made use of his left hand to deflect the ball and trick everyone, getting a precious advantage that allowed him to run freely without anyone upfront until Real Madrid's area. 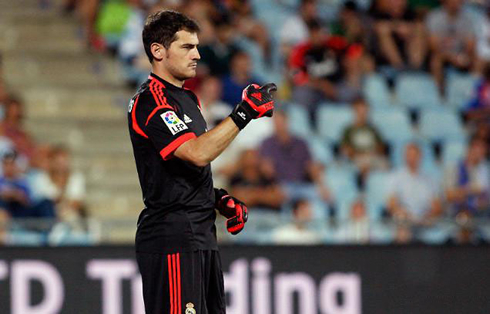 He then assisted Barrada, who received the ball and beat Iker Casillas for the second time on the night. From that point onwards, Real Madrid knew there wasn't much time left and frustration started taking over most of the players, as the game dragged to its end. The Merengues dropped another 3 points and will now have to raise their heads for the Spanish Supercup Clasico 2nd leg against Barcelona, next Wednesday at the Santiago Bernabéu. 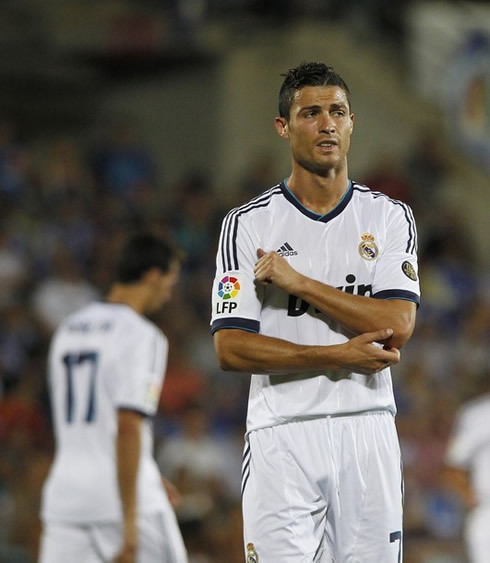 Real Madrid will now face Getafe for the Spanish League next Sunday, on the 26th of August, 2012. You can watch Juventus live stream, Real Madrid vs Barcelona, Atletico Madrid vs Athletic Bilbao, Manchester City vs QPR and Tottenham vs Norwich from our football live streams section.